A mainstay of the world of shinty was yesterday laid to rest in Lochaber. Cattle breeder and former Camanachd Association Referees’ Association president Donnie MacKenzie, of Spean Bridge, died last week, aged 86. A funeral service was held yesterday at Duncansburgh and Kilmonivaig Parish Church of Scotland in the Lochaber village. 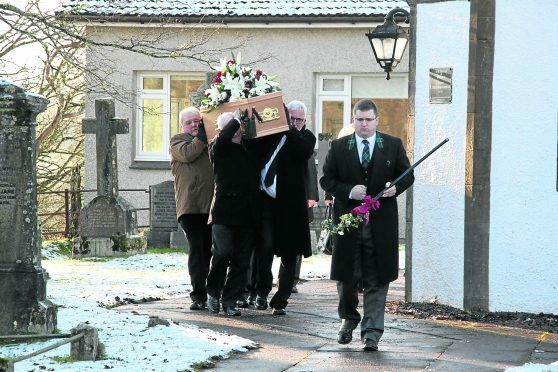 Hugh Dan MacLellan, broadcaster of rugby, shinty and Gaelic games, was one of four legends of shinty who carried Donnie’s coffin to his grave. The others were John MacKenzie, of Newtonmore, David McMaster, of Strathpeffer, and Iain MacPhee, of Lochgilphead. Mr MacKenzie’s son, also Donnie, who gave the eulogy, said: “His two great passions in life were agriculture and shinty. It is for his involvement in these things that he will be long be remembered in Lochaber and beyond. Mr MacKenzie snr had served on numerous shinty committees and groups, but most notably undertook roles on the disciplinary committee and as secretary, chairman and president of his home team Lochaber Camanachd. He was the second president of the Referees’ Association from 1981-86. The silver-mounted caman he was presented with for his contribution to the referees’ body was placed on his coffin at Kilmonivaig. Mr MacKenzie had been a shinty player himself, most often as a goalkeeper with Spean Bridge. Veteran journalist Bill Heaney said: “He was one of the Highland sport’s most knowledgeable and committed friends and peerless in the business of buying, rearing and breeding quality cattle. “He was an accomplished stock-man and breeder of Charolais cattle, working from the Inverlochy Castle Farm on the outskirts of Fort William. Born in Fort Augustus and the son of a shepherd, Donnie and his family eventually moved to Spean Bridge. Donnie was the second youngest of a family of eight. Margaret is the only surviving family member. His brothers were Neil, Murdo, John and Harry, and his other sisters were Annie, and Katy. He is survived by his son, Donnie, himself a former shinty player and the last secretary of the Camanachd Association (1982-86) before it appointed a full-time official.